It says, "The new colors of cider." Sorry, not a fan of cider, so I am not sure that the pink twist would convert me... And yes, cider does have alcohol in it here. A very small percentage... On the very bottom of the ad there is a warning about over-consumption. 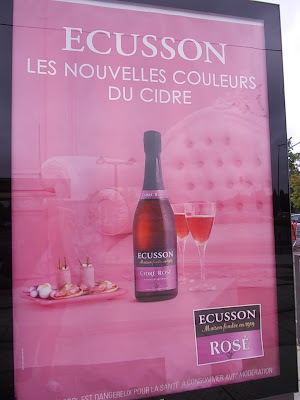 Well, I'm a big fan of cider & if it's pink, well, tant mieux!